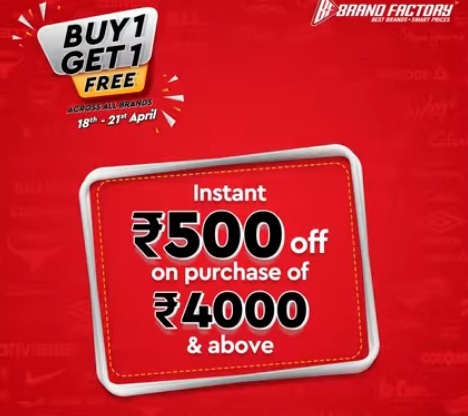 India’s leading chain of fashion discount stores Brand Factory Has Come Up With A New Shopping Offer Buy 1 Get 1 Free Between 18th To 21st April 2019 In Which Users can Buy Any 1 Product And Get 2nd Free Of Cost And Also Get Extra Rs 500 Off On Above Rs 4000 Shopping. Just Run To Your nearest Brand Factory Store And Enjoy the Shopping Hurry. Buy 1 Get 1 Free across all brands On Brand Fctory Shopping Between 18th To 21st April And Get Instant Rs. 500 off On Purchase Of Rs. 4000 And Above. Your Voucher Will Receive On Your Registered Email Id & Mobile Number. If you are from one of the above cities. You can check below to find the nearest brand factory store. How To Grab Brand Factory Offers?